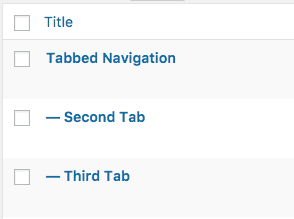 You can now have tabbed on a page in your site, including the home page. Tabbed navigation requires you to create at least two pages, a parent page, and one or more child pages (we don’t recommend more than three). The content you put on the parent page will be visible as the default, first tab. The content of the children will be the second and subsequent tabs with the title of each page displaying as the tab link. To organise the pages as parent/child is quite simple. 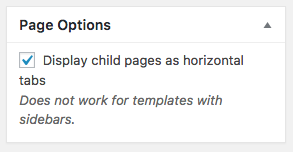 On the Edit screen of a child page, look for the Page Attributes pane, and the Parent menu. Select the page you want to use as a parent from this list, and save. On the Edit screen of the parent page, look for the Page Options pane, and check the box to Display child pages as horizontal tabs. 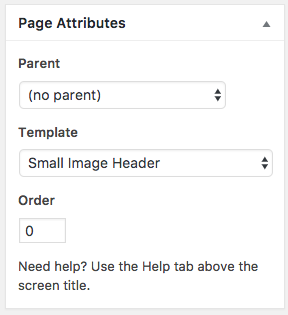 Still on the Edit screen of the parent page, in the Page Attributes pane, you’ll need to choose one of the image header options, because tabs don’t work well with the default headers. Tabs also don’t work with Sidebars, so don’t use any of those templates for the parent page. That’s it. When you view All Pages in the dashboard you should now see your parent and child pages arranged in a hierarchy. And on the front end, the page should now have tabs. Once you’ve got a tabbed page working, you can use it for a home page. Previous Previous post: Go live! Public and other permissions.